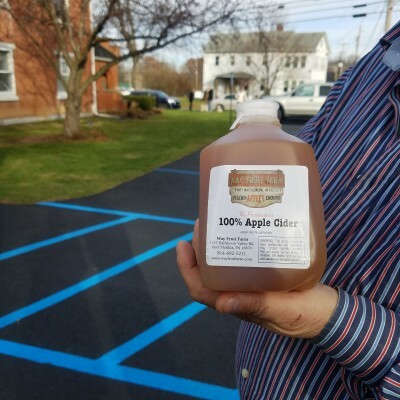 Way Fruit Farm's famous apple cider are among the things you can find at winter markets like the Boalsburg Farmers Market. What can you find in the winter at a farmers market? Local meats, prepared foods, crafty things, and even local produce that either overwinters well, like root vegetables, or can be grown in greenhouses or high tunnels, like salad greens. They are also low-key places to shop for holiday gifts away from the maddening crush. - Altoona Station Farmers’ Market: Located inside the Keystone entrance at Station Medical Center in Altoona, is open every Friday from 10 a.m. to 2 p.m. At this market you can find seasonal local produce, crafts for sale, grass-fed meat, local cheese, and more. - State College Winter Farmers Market: On Fridays from 11:30 a.m to 5 p.m., the State College Winter Farmers Market sets up shop in the State College Borough Building. Among the highlights are amazing Amish-made dairy products from Spring Bank Acres and the fabulous South American flavors of Brazilian Munchies. - Millheim Farmers Market: The Millheim Farmers Market runs through December inside the Hosterman and Stovers Hardware Store in Millheim. Along with the usual local fare, you can also support the local hardware store and get some Christmas shopping done. - Boalsburg Farmers Market: You can be so happy its Tuesday at the indoor Boalsburg Farmers Market, which is open from 2 to 6 pm Tuesdays at the St. John United Church of Christ in Boalsburg. There are around a dozen vendors to peruse, including those that sell fresh local sauerkraut and pork for your New Year’s dinner.